The study aimed to evaluate the bioactive compounds and antioxidant activity of edible fraction (pulp and peel) in green and ripe ripening stages of the fruit and the seed of wild plum (Ximenia americana L.) from different production sites of occurrence in the semiarid region of Brazil. To characterize the edible fraction, the experiment was conducted in a completely randomized design in a factorial 3 x 2, where the first factor was the collection sites and the second factor the maturation stages, with 4 repetitions with 25 fruits each. As for seeds the experiment was conducted in a completely randomized design with 4 repetitions, totaling 25 seeds per experimental plot. The fruits were collected in the communities of Mulunguzinho, Pau Branco and Mata do Meio in the county of Mossoró, RN, Brazil. The edible fraction of the fruit Ximenia americana contains high levels of vitamin C (160,26 mg/100 g), yellow flavonoids (43,12 mg/100 g), total extractable polyphenols (3066,48 mg/100 g) and antioxidant activity (365,55 g fruit/g DPPH e 251,70 μmol Trolox/g) and the seeds contain content of polyphenols (2067,56 mg/100 g) and antioxidant (373,80 g fruit/g DPPH e 279,96 251,70 μmol Trolox/g). The edible part of the green fruit contains higher content of total extractable polyphenols, total carotenoids, yellow flavonoids and total anthocyanins. The edible portion of the fruits and the seeds from the community of Pau Branco contains the lowest content of total extractable polyphenols and antioxidant activity. Key words: Vitamin C, flavonoids, anthocyanins, polyphenols, ABTS, DPPH. O trabalho teve como objetivo avaliar os compostos bioativos e a atividade antioxidante da fração comestível (polpa e casca) nos estádios de maturação verde e maduro do fruto e da semente da ameixa silvestre (Ximenia americana L.) proveniente de diferentes locais de ocorrência de produção na região semiárida do Brasil. Para caracterização da fração comestível o experimento foi conduzido em delineamento inteiramente casualizado em esquema fatorial 3 x 2, sendo o primeiro fator os locais de coleta e o segundo fator os estádios de maturação, com 4 repetições com 25 frutos cada. Já para as sementes o experimento foi conduzido em delineamento inteiramente casualizado, com 4 repetições, totalizando 25 sementes por parcela experimental. Os frutos foram coletados nas comunidades de Mulunguzinho, Pau Branco e Mata do Meio, no município de Mossoró, RN, Brasil. A fração comestível do fruto da Ximenia americana contém elevados teores de vitamina C (160,26 mg/100 g), flavonoides amarelos (43,12 mg/100 g), polifenóis extraíveis totais (3066,48 mg/100 g) e atividade antioxidante (365,55 g fruit/g DPPH e 251,70 μmol Trolox/g) e as sementes elevados teores de polifenóis (2067,56 mg/100 g) e atividade antioxidante (373,80 g fruit/g DPPH e 279,96 251,70 μmol Trolox/g). A fração comestível do fruto verde contém maior conteúdo de polifenóis extraíveis totais, carotenoides totais, flavonoides amarelos e antocianina totais. A fração comestível e as sementes dos frutos provenientes da comunidade de Pau Branco contém menor conteúdo de polifenóis extraíveis totais e atividade antioxidante. Palavras chave: Vitamina C, flavonóides, antocianina, polifenóis, ABTS, DPPH. Departamento de Ciências Vegetais, Universidade Federal Rural do Semi-Árido, Mossoró, Rio Grande do Norte, Brazil. The consumption of tropical fruits has increased in domestic and foreign markets due to the growing enlightenment of their nutritional and therapeutic value of fruits (1). In a market avid for novelty and consumers more aware of the benefits of eating healthy foods, fruits provide more variety to the diet, providing nutritious foods rich in functional compounds that could act as natural antioxidants. Brazilian non-traditional fruit display in vitro great antioxidant capacity and significant amounts of flavonoids, vitamin C and phenolic compounds with unique sensory characteristics and high concentrations of nutrients (2, 1), especially when it comes to wild or native species. These are outstanding sources of antioxidant compounds, which are associated with anti-aging and health promoting properties due to their potential to lower or inhibit oxidative stress (3). These antioxidants differ in nature as minerals, dietary fibers, phytochemicals as phenolics and vitamin C and pigments as carotenoids and chlorophyll, which overall are more abundant in immature fruit. By presenting a rich and diverse flora, the semiarid region of Brazilian northeast has plant species with high potential for commercial exploitation, hitherto underutilized, among numerous plant species present in the area of the caatinga, there is the wild plum (Ximenia americana L.). It is a cosmopolitan tropical plant commonly found in Africa, India, New Zealand, Central America and South America. In Brazil, its occurrence is mainly in the semiarid region and coastal plains of the northeast of Brazil (4). Wild plum is used in traditional medicine for various purposes in many countries of the African continent (5). In Brazil, in the Northeast region, the wild plum is used in traditional medicine, constituting a medicinal plant of Caatinga. The fruit of the wild plum is rich in vitamin C (6) and phenolic compounds (7, 8), which are a natural antioxidant important in the human diet. The seeds, considered purgative and very tasty are used as seasoning, have increased their importance not only for nutritional value, but also for use in the cosmetics industry, and is considered a promising source of raw materials for use in production of herbal medicines (9). Recent research executed by our research group (10) demonstrate great potential of wild plum coming from the Brazilian semiarid region, especially when compared with other fruit species traditionally consumed. The authors report that the pulp of the wild plum fruit contains high levels of carboidratros, functional compounds and antioxidant activity. They do mention that the seeds of wild plum have present high levels of lipid, protein, starch, extractable polyphenols and total antioxidant activity and both the pulp and the seeds have a considerable content of N, P, K, Cu and Mn. In contrast, for the utilization and conservation of germplasm of particular species, it is essential to the best cognition of the existing materials in the region, for the wild plum is dispersed in Caatinga and may have genetic variability among the plants of the different regions and the composition nutritional fruits. Research cited above accomplished by our research group has done a characterization of wild plum fruit, but this study featuring the fruits of the plants found in different regions has not been done yet, making it necessary for the selection of plants with fruits of good nutritional quality. Thus, this study aimed to evaluate the bioactive compounds and antioxidant activity of wild plum coming from different regions of the Caatinga. The wild plum fruits used were derived from plants that are spontaneously and dispersed in three areas with occurrence of production in the county of Mossoró, RN, Brazil. The collection areas were: Community of Mulunguzinho (5° 16' 52'' S and 37° 11' 46'' W), Community of Pau Branco (04º 54' 9.4'' S and 37º 21' 59.9'' W) and Community of Mato do Meio (Malvinas Neighborhood - 5° 14' 28'' S and 37° 17' 29'' W), designated as collection sites 1, 2 and 3, respectively. Fruits originating from the collection site 2, unlike the collection sites 1 and 3, were obtained from plants located in a commercial production farm of melon, which is made use of all the technological package for adduction. The climate, according to Köppen classification, is "BSwh", that is, dry and very hot, with two seasons: a drought that usually goes from June to January and a rainy season from February to May. The soil of the collection site 1 is classified as Podzolic Red Yellow Eutrophic Equivalent, collection site 2 as Oxisol and collection site 3 as Rendzina. Climatic data of collection sites were obtained in the period from October to December of 2011 and January to February of 2012, period corresponding to the production and harvest of the fruits of wild plum. The collection sites 1 and 3, for being closest to weather station at the Universidade Federal Rural do Semi-Árido (UFERSA), the data of the institution were obtained, with average values of relative humidity with 62.82%, average temperature of 27.87 °C and accumulated precipitation of 114.05 mm. As for the data of collection site 2 (Community of Pau Branco) were provided by the Instituto Nacional de Meteorologia (INMET), obtained from a station on-site collection, in which, the average values were: relative humidity of 65.1%, temperature average of 27.94 °C and 65.4 mm accumulated precipitation. The fruits were harvested directly from the plant canopy at two ripening stages: immature (green colored peel) and mature (yellow colored peel), in plant populations that were found spontaneously and scattered in the woods of caatinga of three communities in the county of Mossoró, RN, Brazil. After that, they were washed in running water, being discarded those who had cuts or grooves and those attacked by insects or animals and selected for uniformity of maturation and no damage marks. Pulp (composed of both mesocarp and exocarp or peel) was removed from the seeds by hand with the aid of stainless steel knives. Only mature seeds were evaluated. Pulp tissue was homogenized in Ultra-Turrax® (IKA, Germany) homogenizer, meanwhile seeds were crushed in a Wiley® stainless-steel (Thomas Sci., USA) mill and both samples were stored in a domestic freezer (-20 °C) until the analysis were performed. Two separate experiments were conducted in which, for the edible fraction (pulp + peel) the experiment was conducted in a completely randomized design in a factorial 3 x 2, where the first factor was the three collection sites (Community of Mulunguzinho, Pau Branco and Mato do Meio) and the second was the maturation stages (green and ripe), with 4 repetitions, totaling 25 fruits per experimental plot. For seeds the experiment was conducted in a completely randomized design with four replications, totaling 25 seeds per experimental plot. The total vitamin C was determined by titration with 0.02% 2,6-dichloro-indophenol (DFI) (Vetec, Brazil) as proposed by Strohecker and Henning (11). One gram of pulp was diluted to 100 mL of 0.5% oxalic acid and homogenized. Then, 5 mL of this solution was diluted to 50 mL with distilled water and titrated and results were expressed as mg/100g FW (fresh weight). Anthocyanins and yellow flavonoids were extracted and determined as described by Francis (12). One gram of pulp was extracted with a 95% ethanol/1.5 N HCl (85:15) solution, supplied by Vetec, vortexed for 2 min and then, brought to 50 mL with the extracting solution. Protected from the light, the mixture was refrigerated at 4 oC for 12 hours, then filtered on Whatman N.1 paper and the filtrate was collected. The absorbance of the filtrate was measured at 535 nm for the total anthocyanin content using an absorption coefficient of 98.2 mol/cm and at 374 nm for the total yellow flavonoid content using an absorption coefficient of 76.6 mol/cm. Both results were expressed as mg/100g FW. Absorbances were monitored with UV-VIS spectrophotometer (model UV-1600 by Pró-Análise®, Brazil). Total carotenoids were measured as described by Higby´s (13). Five grams of pulp were homogenized with 15 mL alcohol and 5 mL hexane and then (Vetec), let to stand for 90 min. The mixture was filtered into a 25 mL flask, then 2.5 mL acetone was added and volume completed with hexane. Absorbance was monitored at 450 nm and results were expressed as mg/100g FW. The procedure developed by Larrauri et al. (14) was used and is described as follows: 1 g of sample were weighed into centrifuge tubes and extracted sequentially with 20 ml of methanol/water (50:50, v/v) at room temperature for 1 h. The tubes were centrifuged at 10,000 rpm for 20 min and the supernatant recovered. Then was added 20 ml of acetone/water (70:30, v/v) to the residue at room temperature, extracted for 1 h and centrifuged. Extracts of methanol and acetone were mixed, checking to 50 ml with distilled water, and extract used to determine the content of total extractable polyphenols and antioxidant capacity. The total phenol content was measured by a colorimetric assay using Folin–Ciocalteu reagent as described by Obanda and Owuor (15). Before the colorimetric assay, the samples were subjected to extraction in 50% methanol and 70% acetone as described by Larrauri et al. (14). The determination was executed using aliquots from 4 μL to 100 μL of the extracts and they were mixed with 1 ml of the Folin–Ciocalteu reagent, 2 ml of the 20% sodium carbonate solution and 2 ml of distilled water. Following that the samples were agitated and left at rest for at least 30 min in the dark. The readings were made in spectrophotometer at 700 nm, using the standard curve of gallic acid 98% (0 - 50 μg). Results were expressed as gallic acid equivalents (GAE) mg/100 g FW. The total antioxidant activity (TAA) was determined using 2,2-azinobis-3-ethylbenzthiazoline-6-sulphonic acid radical cation (ABTS*+, Sigma) method as described by Miller et al. (16). Before the colorimetric assay, the samples were subjected to a procedure of extraction in 50% methanol and 70% acetone. The cation ABTS•+ radical was generated through the reaction of the ABTS stock solution 7 mM with 140 mM of potassium persulfate leaving it in the dark at room temperature for 16 h before use. The ABTS•+ radical was diluted in ethanol for an absorbance of 0.70 ± 0.05 at 734 nm. The spectrophotometric reading was made after exactly 6 min from the mixture of 30 μL of the extract with 3 ml of the radical. It was used the synthetic antioxidant Trolox at a concentration of 100 - 2000 μM in ethanol to prepare a calibration curve. The results were expressed in μmol of Trolox/g FW. The free radical-scavenging by DPPH assay is based on the sequestering of DPPH radical (2,2-diphenyl-1-picryl-hydrazyl, Sigma) by antioxidants, decreasing absorbance at 515 nm and was proposed by Brand-Williams et al. (17) and modified by Sánchez-Moreno et al. (18). A methanol solution containing 0.06 mM DPPH was prepared and aliquots of 100 μL were added and absorbance monitored at 515 nm, until stabilization (110 min for immature fruit pulp, 85 min for mature and 30 min for seed). The antioxidant activity was expressed as the concentration of antioxidant able to reduce the free radicals by 50% (EC50) and expressed in g/g DPPH. The results were interpreted by analysis of variance using the program Sisvar version 5.1 Build 72 program and the averages submitted to Tukey test at 5% probability. Results for bioactive compounds of edible fraction of wild plum fruit are presented in Tables 1 and 2. According to the analysis of variance, there was a significant effect of collection site factor for vitamin C (Vit. C), total carotenoids (TC) and yellow flavonoids (YF). As for the maturation stage factor was no significant effect for TC and YF and the interaction (collection sites x maturation stages) was significant for total anthocyanins (TAN) and total extractable polyphenols (TEP). For seeds there was no significant effect for vitamin C (Vit. C), total carotenoids (TC) and total anthocyanins (TAN), however, significant effect to the yellow flavonoids and total extractable polyphenols (TEP). Table 1. Bioactive compounds from edible fraction (pulp and peel) of the fruit of wild plum green and ripe coming from different places in the semi-arid region of Brazilian northeast. Means followed by the same capital letter in the line and lower case in the column do not differ, according to the Tukey test at 5% probability. Table 2. Ascorbic acid (Vit. C), carotenoids (CT), yellow flavonoids (YF), anthocyanins (ANT), total extractable polyphenols (TEP) and total antioxidant activity (TAA) by DPPH and ABTS method in seeds of wild plum coming from different places in the semi-arid region of Brazilian northeast. Means followed by the same lower case letter in the column do not differ, according to the Tukey test at 5% probability. Vitamin C content presented on average 160.26 mg vitamin C/100 g of edible portion. The fruits from the collection sites 1 and 3 stood out presenting more content of vitamin C (Table 1). The seeds showed an average content of 70 mg vitamin C/100g (Table 2). 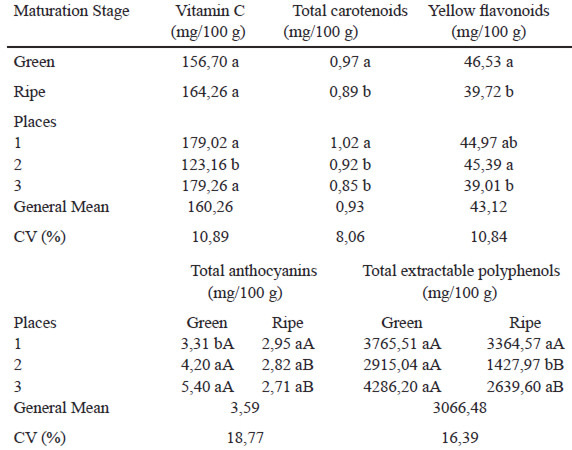 The content of total carotenoids and yellow flavonoids were higher in fruit on the green maturity stage (Table 1). For total carotenoids, fruit from the collection site 1 showed edible fraction with higher content (1.02 mg/100 g), while for the seeds there was no difference between collection sites which presented on average content of 0.61 (Table 2). For yellow flavonoids, the fruits of the collection site 2 stood out with higher content in the edible fraction, however, did not differ from region 1 (Table 1), which on average showed content of 43.12 mg/100 g. The seeds showed no difference between the collection sites, on average showed content of 15.83 mg/100 g of seed (Table 2). To total anthocyanins, ripe fruit of the collection site 3 had lower content (Table 1), and no differences were observed for this content in the seed between the different collection sites (Table 2). With respect to total extractable polyphenols (TEP), fruits in green maturity stage showed higher content except for the collection site 1, where there was no difference between the maturity stages; the ripe fruit of the collection site 2 showed less content. Already the seeds originating from the collection site 1 stood out with the highest content, followed by regions 3 and 2, respectively (Table 2). For total antioxidant activity (TAA), there was significant interaction in both methods used. By DPPH method, the fruits from the collection site 1 had higher antioxidant potential (less g fruit/g DPPH) in both maturity stages (green and ripe) when compared to the fruits (green and ripe) from collection sites 2 e 3, behavior similar to that obtained by the ABTS method (Table 3). Fruits collected at site 1 showed no difference in antioxidant activity among the maturation stages. Ripe fruit of the collection site 2 showed lower TAA when compared to the TAA of the fruits from collection sites 1 and 3 (Table 3). For seeds it was observed significant effect only for the DPPH method, not observing a difference by ABTS method. Seeds from the collection sites 1 and 3 showed higher antioxidant potential (less g fruit/g DPPH) when compared to the seeds from collection site 2 (Table 2). Table 3. Total antioxidant activity (TAA) by DPPH and ABTS method of edible fraction (pulp and peel) of the fruit of wild plum green and ripe coming from different collection sites of the semi-arid region of Brazilian northeast. The vitamin C content present in the pulp (green and ripe) and in the seed of wild plum is expressive, making it an alternative and cheaper source of vitamin C for underserved populations of the Brazilian semiarid. The vitamin C content present in 100 g of wild plum pulp is four times greater than the daily intake recommended for children and adults, in which settles the consumption of vitamin C 45 mg/day. However, it should be caution to the intake of the pulp and/or seed, especially for children, because it is a fruit rich in lipids and carbohydrates (10). Silva et al. (6) obteined average content of 251.21 mg of vitamin C/100 g in the pulp of wild plum fruit, values higher than those found in this study, which corroborates be a fruit rich in vitamin C. This is even more expressive when compared to guava (99.2 mg/100 g, Psidium guajava L.), orange (73.3 mg/100 g, Citrus sinensis), tangerine (112 mg/100 g, Citrus reticulata) and açai (84 mg/100 g, Euterpe oleracea) (1, 19). However, much lower than the content present in camu-camu (1882 mg/100 g, Myrciaria dubia) and acerola (1357 mg/100 g, Malpighia emarginata) (1), known as the fruits with the highest content of vitamin C.
Carotenoids are antioxidants as well as precursors of important vitamin A and wild plum pulp presented higher contents than cashew apple (0.4 mg/100 g, Anacardium occidentale), ‘camu camu’ (0.4 mg/100 g, Myrciaria dubia), carnaúba (0.6 mg/100 mg, Copernicia prunifera), jaboticaba (0.32 mg/100 g, Myrciaria cauliflora), jambolan (0.51 mg/100 g, Syzygium cumini), mangaba (0.3 mg/100 g, Hancornia speciosa) and myrtle (0.5 mg/100 g, Blepharocalyx salicifolius) (1). The content found for ameixa silvestre seeds, 0.59 mg/100 g, was higher than found for ‘pequi’ almond (0.295 mg/100 g, Caryocar brasiliense) (20). Flavonoid content of edible fraction of this work was higher than that observed by Lamien-Meda et al. (7) for fruits (pulp and peel) of wild plum from Burkina Faso, Africa, noting averages values nether than 31 mg/100 g. Results of researchs have shown a wide variation in the content of flavonoids (0.03 mg/100 g to 2700 mg/100 g) (21). In the wild plum, flavonoid content is nether than the present in nuts (18.02 mg/100 g), pistachio (6.06 mg/100 g), hazelnut (6.71 mg/100 g) and kernels (2.46 mg/100 g) (21). Such compounds play an important role in promoting health, protect the organism from damage produced by oxidizing agents, considered excellent antioxidants, sequestering and inactivating free radicals. According to Vasco et al. (22) wild plum may be classified as a good source of phenolics as their contents were greater than 500 mg GAE/100g. The TEP content of this study was higher than that obtained by Mora et al. (8) who found variation between 970 to 2960 mg/100 g for fruit of wild plum from Mexico, and Lamien-Meda et al. (7) who obtained content ranging from 2230.0 to 2086.67 mg GAE/100 g in 70% MeOH extract and 70% acetone, respectively, for wild plum from Africa. Rufino et al. (1) evaluated eighteen non-traditional Brazilian fruit species, and found that the richest fruit in TEP were camu-camu (1176 mg GAE/100 g), acerola (1063 mg GAE/100g, Malpighia emarginata) and puçá-preto (868 mg GAE/100 g, Mouriri pusa), these values are lower than those found in wild plum. Also presents higher content of TEP when compared to different commercial açaí pulp (Euterpe oleracea) (23) which makes the wild plum a major source of TEP. The literature contains variations of total polyphenols between 206 to 1602 mg/100 g in pinions and nut, respectively (21) lower than the seed of this study. The TEP content is high, which suggests that the seed of wild plum is an excellent source of the bioactive compound. Seeds are an important natural source of antioxidants, which was observed for other species - like ethanol extract of cagaita seed (Eugenia dysenterica) and ethanol extract of araticum seed (Annona crassiflora) (cerrado species) - have high content of phenolic compounds (2). Lamien-Meda et al. (7) report that fruits of wild plum from Burkina Faso, Africa, exhibit high antioxidant capacity. Rufino et al. (1), when analyzing the total antioxidant activity by DPPH and ABTS method of eighteen non-traditional tropical fruits, TAA observed was lower than in the wild plum. Wild plum fruits have high antioxidant potential and may, therefore, be recommended for both fresh consumption and for use in pharmaceutical, cosmetic and nutritional because of the benefits they can provide to consumer health, sequestering free radicals, helping to reduce the incidence of chronic and degenerative diseases. It was observed that the antioxidant activity and the content of TEP and vitamin C were lower in fruits originating from the collection site 2, derived from plants occurring nearby the melon production areas that makes use of fertilizer and irrigation, which possibly makes the soil of the site referred more fertile collection, providing greater availability of plant nutrients and an environment with less stress. Agreeing with the literature that reports that the bioactive compounds responsible for antioxidant potential of the fruit, they are synthesized in greater amounts when the plant is subjected to stress (24). Seeds are an important natural source of antioxidants (2); oftentimes presenting greater antioxidant activity than the edible portion of the fruit itself, as reported by Soong and Barlow (25) for whom avocado seeds, mango, jackfruit and tamarind exhibit antioxidant activity and total content of phenols greater than the edible portion of the respective fruit. The edible fraction (pulp + peel) of Ximenia americana fruit contains high levels of vitamin C, yellow flavonoids, total extractable polyphenols and antioxidant activity and the seeds polyphenols and antioxidant activity. The edible part of the green fruit contains higher content of total extractable polyphenols, total carotenoids, yellow flavonoids and total anthocyanins. The edible portion and the seeds of the fruits from the community of Pau Branco (collection site 2) contains the lowest content of total extractable polyphenols and antioxidant activity. We thank Conselho Nacional de Desenvolvimento Cientifico e Tecnologico (CNPq), Fundação de Apoio à Pesquisa do Rio Grande do Norte (FAPERN), Coordenação de Aperfeiçoamento de Pessoal de Nível Superior (CAPES), Brazil and Universidade Federal Rural do Semi-Árido (UFERSA) for the scholarships and financial support. Rufino MSM, Alves RE, Brito ES, Pérez-Jiménez J, Saura-Calixto F, Mancini-Filho J. Bioactive campounds and antioxidant capacities of 18 nontradicional tropical fruits from Brazil. Food Chem 2010, 121(4): 996-1002. Roesler R, Malta LG, Carrasco LC, Holanda RB, Sousa CAS, Pastore GM. Atividade antioxidante de frutas do cerrado. Ciênc Tecnol Aliment 2007, 27(1): 53-60. Hassimoto NMA, Genovese MI, Lajolo FM. Antioxidant activity of dietary fruits, vegetables, and commercial frozen fruit pulps. J Agric Food Chem 2005, 53(8): 2928-2935. Souza VC. Botânica sistemática: guia ilustrado para identificação das famílias de Fenerógamas nativas e exóticas no Brasil baseado em APG II. 2 ed. Nova Odessa. SP: Instituto Plantarum, 2008. 703p. Le NHT, Malteruda KE, Diallob D, Paulsena BS, Nergårda CS, Wangensteen H. Bioactive polyphenols in Ximenia americana and the traditional use among Malian healers. J Ethnopharmacol 2012, 139(3): 858-862. Silva GG, Souza PA, Morais PLD, Santos EC, Moura RD, Menezes JB. Caracterização do fruto de ameixa silvestre (Ximenia americana L.). Rev Bras Frutic 2008, 30(2): 311-314. Lamien-Meda A, Lamien CE, Compaoré MMY, Meda RNT, Kiendrebeogo M, Zeba B, et al. Polyphenol content and antioxidant activity of fourteen wild edible fruits from Burkina Faso. Molecules 2008, 13(3): 581-594. Mora VHF, Franco-Mora O, López-Sandoval JA, Pérez-López DJ, Balbuena-Melgarejo A. Characterization of wild plum (Ximenia americana L. var. americana; Olacaceae) fruit growing at Tepexi de Rodríguez, Puebla, Mexico. Genet Resour Crop Evol 2009, 56: 719-727. Brasileiro MT, Egito AA, Lima JR, Randau GCP, Rolim Neto PJ. Ximênia americana L: Baotânica, química e farmacologia no interesse da tecnologia farmacêutica. Rev Bras Farm 2008, 89(2): 164-167. Sarmento JDA, Morais PLD, Souza FI, Miranda MRA. Physical-chemical characteristics and antioxidant potential of seed and pulp of Ximenia americana L. from the semiarid region of Brazil. Afr J Biotechnol 2015, 14(20): 1743-1752. Strohecker R, Henining HM. Análisis de vitaminas: métodos comprobrados. Madrid: Paz Montalvo, 1967. 42p. Francis FJ. Analysis of Anthocyanins. In: Markakis P. Anthocyanins as food colors. London, UK: Academic Press, 1982. 263p. Higby WK. A simplified method for determination of some the carotenoids distribution in natural and carotene-fortified orange juice. J Food Sci 1962, 27(1): 42-49. Larrauri JA, Rupérez P, Saura-Calixto F. Effect of drying temperature on the stability of polyphenols and antioxidant activity of red grape pomace peels. J Agric Food Chem 1997, 45(4): 1390-1393. Obanda M, Owuor PO. Flavonol composition and caffeine content of green leaf as quality potential indicators of Kenyan black teas. J Sci Food Agric 1997, 74(2): 209-215. Miller NJ, Diplock AT, Rice-Evans C, Davies MJ, Gopinathan V, Milner A. A novel method for measuring antioxidant capacity and its application to monitoring the antioxidant status in premature neonates. Clin Sci 1993, 84(4): 407-412. Brand-Williams W, Cuvelier ME, Berset C. Use of a free radical method to evaluate antioxidant activity. Food Sci Technol 1995, 28(1): 25-30. Sanchez-Moreno C, Larrauri JA, Saura-Calixto FA. Procedure to measure the antiradical efficiency of polyphenols. J Sci Food Agric 1998, 76(2): 270-276. Taco. Tabela brasileira de composição de alimentos/NEPA-UNICAMP. Campinas, SP: NEPAUNICAMP, 2011. 161p. Lima A, Silva AMO, Trindade RA, Torres RP, Mancini-Filho J. Composição química e compostos bioativos presentes na polpa e na amêndoa do pequi (Caryocar brasiliense Camb.). Rev Bras Frutic 2007, 29(3): 695-698. Bolling BW, Chen C-YO, Mckay DL, Blumberg JB. Tree nut phytochemicals: composition, antioxidant capacity, bioactivity, impact factors. A systematic review of almonds, Brazils, cashews, hazelnuts, macadamias, pecans, pine nuts, pistachios and walnuts. Nutr. Res. Rev 2011, 24(2): 244-275. Vasco C, Ruales J, Kamal-Eldin A. Total phenolic compounds and antioxidant capacities of major fruits from Ecuador. Food Chem 2008, 111(4): 816-823. Santos GM, Maia GA, Sousa PHM, Costa JMC, Figueiredo RW, Prado GM. Correlação entre atividade antioxidante e compostos bioativos de polpas comerciais de açaí (Euterpe oleracea Mart). ALAN 2008, 58(2): 187-192. Taiz L, Zeiger E. Fisiologia vegetal. Artmed, Porto Alegre, Brasil. 2008. 820p. Soong Y, Barlow PJ. Antioxidant activity and phenolic content of selected fruit seeds. Food Chem 2004, 88: 411 – 417.